Just before my friend Katy moved to the UK eight years ago, she came over one evening with boxes of plants she’d dug up from her garden. Some of these plants were from her grandfather’s wonderful garden in Victoria. One of these plants was a peony. Together, we put the plants into my garden, with the idea that when she and her family returned from the UK, two years later, she’d dig them back up and put them in her new garden…wherever that would be. 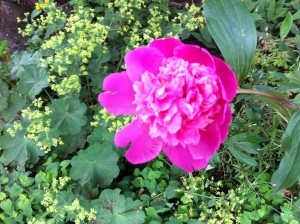 The peony never bloomed. When she did move back, I told her. Katy said they can take up to seven years after a move to bloom. (So moving is traumatic…) Katy is a third generation–or more–green thumb gardener. I am a second generation no-thumbs gardener (although my grandma had a knack for veg). Last summer was seven years. How many times I’ve looked at that peony, right in the outside edge of my half-circle right-by-the-front-of-the-house garden and wondered about just digging it up and being done with it. Last week I realized that there was actually a small, round bud on the end of the tallest stem. No! And several days ago, it opened. EIGHT years. One past the max. Late bloomer. Like me. I’ve always been one of those. You’re supposed to hit your writing stride, your strongest years as a writer, in your fifties, they say. Here I come! How could I have ever thought to tear out the green scraggly stuff?